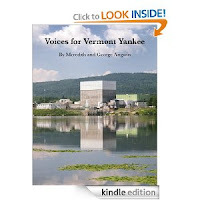 I want to give a shout out to Meredith Angwin, who has just published a new Kindle e-book called, Voices for Vermont Yankee, now available on Amazon. The book consists of testimony that people have given in favor of Vermont Yankee at Public Service Board hearings. Meredith is a fellow blogger and awes me with how prolific she is. She, her husband, George, and others have worked tirelessly for Vermont Yankee, and have had a huge impact on the prospects for this plant. I have been following her work over the last several years and have been very impressed at the thoughtful and balanced approach she has taken to arguing the case for Vermont Yankee. I have been particularly impressed at how she deals with the various kinds of personalities active on nuclear issues. I am therefore delighted to see that she has consolidated so much information in book form. The book is truly a cost-effective investment for anyone who engages in discussions about the merits of nuclear power. It costs only $2.99 (25% of which Meredith and George have pledged to give to the Ethan Allen Institute, an independent, nonpartisan, nonprofit organization devoted to free-market public policy research and education). It is a compendium of arguments for nuclear energy, in many voices and from many perspectives, so should be a valuable reference tool. Meredith also hopes it will inspire others to take an activist role for nuclear energy. Clearly, the book provides both a model for the types of actions that have proved successful and some of the facts that she and the others have found useful in framing their arguments. On a personal note, I wish Meredith great success with this book. In addition to inspiring activism, I am hoping it may inspire me to follow her lead and do the same thing with my blog some day! Some time ago, I wrote about a proposal by Takuya Hattori, President of the Japan Atomic Industrial Forum (JAIF), for an international team to work on the decommissioning of the damaged Fukushima plants. He argued that this was an international issue, would benefit from the collaborative efforts of the international community, and would be a service to the rest of the nuclear community. This is clearly a move in the right direction. Although the cleanup from Fukushima has unique aspects related to the contamination resulting from the accidental releases, there are expected to be lessons learned that could be applicable to the decommissioning of all nuclear plants. There had been growing concern in the international community that Japan might try to "go it alone" on their decontamination/decommissioning efforts, hoping to monopolize the global decommissioning market in the years ahead. A multilateral undertaking would help dispel that concern. There are, of course, many issues to be ironed out before such an effort can begin. In the interview, Amano laid out some of his ideas for such a group and indicated that the IAEA would be sending an international team of experts to Japan for further discussions. We will continue to watch as this initiative evolves, but I find the fact that the IAEA has come out with such a forceful proposal to be a good omen. This post was inspired by Will Davis, who blogs at Atomic Power Review. Sometime in January, Will solicited stories about "favorite nuclear artifacts" for a planned post on the ANS Nuclear Cafe blog. I had a couple in mind, but was still on the road, completing an 8-week, around-the-world trip, so I put it off until I returned. OK, OK, I know it's an excuse, but I do think it trumps the "my dog ate my homework" excuse! Alas, by the time I got around to writing up my story, I was just hours too late. A couple of hours after I hit the send button, I got a message that his blog of people's favorite nuclear artifacts was posted. If you haven't read those stories, I recommend you do--after you read the rest of my post, of course. After consulting with Will, we've agreed that I should post my story on my own blog. The story of my favorite nuclear artifact relates to two meetings I had with Glenn Seaborg. When I was a junior or senior in high school, I won an all-expense-paid trip to Washington, DC, for a student science fair or a science symposium. (I can't recall specifically what the event was.) One of the luminaries we met was Glenn Seaborg, who, at the time, was Chairman of the old Atomic Energy Commission. I was just gaga--a Nobel Prize winner and the head of a major government agency. Who would think I'd ever meet such a person, let alone at the tender age of 16 or 17? For me, this was better than meeting a rock star! Somehow, I got up the nerve to thrust the program for the event in his hand and ask for his autograph. He graciously complied. I had the program for a long time, but over the decades, it disappeared somewhere in the recesses of my parents' basement. Cut to a time many years later, when I was Chair of the ANS Honors and Awards Committee. We had just established the Glenn Seaborg Award, and he was asked to present the very first award. As Chair of the H&A Committee, I had the honor to sit next to him at the luncheon preceding the awards ceremony. Desperate to make conversation with this man, who I still regarded with awe, I recounted to him that he had once given me his autograph, but alas, I was embarrassed to admit to him that it had been misplaced. Without a moment's hesitation, he said, "Then I must give you another autograph." Before I could say another word, he grabbed my copy of the H&A awards luncheon program, which had been sitting by my dinner plate, and signed it! Alas, over the years, that autograph also eventually disappeared, this time in the recesses of my own basement. However, it is still there somewhere, and just as soon as I have a chance to go through my basement :-), I'm sure I'll unearth it. This time, I'll give it a place of honor. To me, it symbolizes the fact that, as famous a man as he was, he remained a true gentleman. Continuing the theme I started last week of looking at the unanticipated effects of technologies that most of us would assume are benign, I want to report today on several recent articles on biomass that also address some consequences that were not initially considered. In this case, two of them point to issues I have heard about before (although not in the first flush of excitement about biomass), but the renewed coverage of the issues got my attention. The third article, however, was new--at least to me. The first of these articles carries the alarming headline "most biofuels are not green." As always, the truth is more complicated. The point of the article is that there are multiple interactions and several advantages and disadvantages of biofuels, depending on the circumstances. It makes a difference to the net emissions savings whether the biofuels are grown on agricultural land (in which case, they can, of course, have a detrimental effect on food production) or whether forested land has to be cleared for biofuels production. There can be other environmental effects as well, such as acidification of the soil, and pollution of lakes and rivers from runoff of fertilizer. On the other hand, biomass production can, under some circumstances, help make desert land arable. A related article delves more deeply into how to assess the availability of land for biomass production. The article talks about the fact that proposals often talk about using "surplus land" for biomass production, yet, "We still have limited understanding of how much land is truly surplus and suitable for energy crop production,"according to Dr. Dauber, the lead author of the study. The third article, however, was the one that really got my attention. Increasing attention has been given recently to the use of algae as a source of biomass. Some articles have speculated that algae-based biomass would avoid a lot of the agricultural concerns. However, now concerns are being raised about algae-based biomass. Again, there is an eye-catching title: large-scale production of biomass made from algae poses sustainability concerns. The concerns raised in this article include: "the relatively large quantity of water required for algae cultivation; magnitude of nutrients, such as nitrogen, phosphorus, and CO2, needed for cultivation; amount of land area necessary to contain the ponds that grow the algae; and uncertainties in greenhouse gas emissions over the production life cycle." Once again, my guess is that we will find ways to increase biomass production, but we clearly must consider very carefully where and how we grow such crops. I continue to be fascinated by the number of unexpected impacts and interactions with the environment that people are identifying from every energy-related technology. We are never surprised to learn of impacts from technologies that are large or that use fossil fuels or nuclear power. However, we somehow never expect impacts from distributed technologies, or "natural" technologies such as wind, solar and biomass. I therefore like to keep track of these impacts as I learn about them. I have recently stumbled over a couple that were new to me. We have heard a lot about migrating birds flying into wind farms and being killed. Now, we are learning that even if the birds aren't killed, the existence of wind farms may affect their lives. A study of gannets in the English Channel showed that wind farms could affect the feeding habits of the birds. Is this serious? I don't know. I assume this is a preliminary finding and that more study will be needed, but in the meantime, some are raising concerns that this factor might need to be taken into account in siting decisions for wind farms. Another article reported that replacing old, heat-trapping paving materials with new, cooler materials could could lead to higher electricity bills for surrounding buildings! This is because the new paving materials stay cool by reflecting significantly more of the sun's rays than traditional pavements. If the rays are reflected back into space, it helps cool surrounding areas. However, a portion of these rays can be reflected onto the windows of nearby buildings. In the study reported, windows facing the reflective pavements got 40 percent more daily sunshine in summer (12 percent more in the winter) as windows facing traditional paving surfaces. This finding demonstrates yet again that trying to improve one thing can have negative effects in other areas. Again, is this serious? Most likely, ways will be found to overcome the effect now that it's been discovered. In fact, the article even indicated that the new materials could have a positive effect in areas where buildings can automatically respond to additional sunlight because they are equipped with smart lighting solutions, such as dimmers run by photo-sensitive cells. However, buildings without these features do not fare as well. Thus, there is a solution, but it can add to the cost of implementing the improvements. The point of mentioning these findings is not to try to slam alternate technologies. I firmly believe that most of these types of findings can be addressed successfully and are not "make or break" factors for the viability of a technology. My major reason for reporting on these kinds of findings is to demonstrate that nothing is simple in the energy business. Every technology has benefits, but every technology also has shortcomings. Most of these shortcomings can be addressed, but they first have to be recognized, and then there will be a cost to address them. With all our technological understanding and experience, it is taking time and effort to identify and address such impacts. Depending on our audience, we can regale any willing listeners--or anyone we can tie to their seats--with tales of all the interesting ancient ruins we saw, make them salivate as we describe some of our best meals, or bore them to death with hundreds of photographs. For this audience, I will do none of the above. Rather, I will focus on some energy-related observations. Thankfully, we avoided some of the real energy trouble spots that were in the news during our tour. Most notably, we were not caught in China's suffocating air pollution. And we were nowhere near any of the disputed oil and gas fields. Nevertheless, we had our share of experiences that reminded us of just how important energy is, how much of the world still lacks what we take for granted, and how controversial all new energy is. For example, despite the fact that our hotels were mostly at least somewhat upscale, there were numerous brief power outages in some places. It was not so much the power outage that got our attention, but rather the fact that no one even paused or looked around. The flickering of lights and fans was such a common part of the background that locals didn't even notice it. Our final stop tied all our observations together neatly. We stayed with friends in Lincolnshire, outside of London. Lincolnshire still has a very rural look in most places, with large farms--and with coal mines. Despite that, we saw signs all over the countryside saying, "Say NO to Windmills." 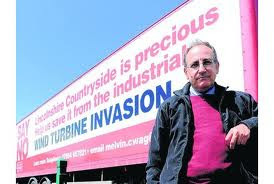 This somewhat surprised us, as the land looked spacious enough to support some windfarms without making a significant dent on the bucolic nature of the countryside. In any event, it was difficult for us to see how the windmills were any worse than the several coal mines where we passed huge piles of coal along the rail line. And in the United States, in many places, the farmers are profiting from the installation of wind turbines on their land. We never did figure out what the fundamental objection was. Are the economics in the UK much different than in the US, so there is no benefit to the farmers? Has the local population drawn a line, figuring that the coal mines are enough of a contribution to England's energy supply? Or is it NIMBY, pure and simple? In any event, the trip, in addition to being many other things, was a reminder of at least a couple of the key issues that continue to dominate the energy scene--the lack of sufficient energy supply in many parts of the world, and the lack of acceptance of new facilities to produce more energy.